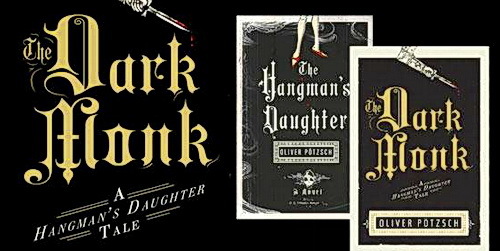 The Hangman’s Daughter and The Dark Monk, by Oliver Pötzsch. Mariner, 2011 and 2012; reviewed in the trade paperback editions. “The Hangman’s Daughter” and “The Dark Monk” are the first two novels in a new historical mystery series by the German author Oliver Pötzsch. The stories are set in the back woods of Bavaria in the late 17th century, a largely unfamiliar setting (at least to me), and a refreshing change from the usual Elizabethan England or medieval France. It’s a few years after the end of the catastrophic Thirty Years War that devastated central Europe, and Germany is still pulling itself back together. Elsewhere, in the great European cities, the Enlightenment may be opening minds, but in the deep forests of Bavaria, the traditions of the Dark Ages still persist. The small, backward city of Schongau is home to the series’ three protagonists: Jakob Kuisl, the town’s hangman, who also acts as its interrogator and torturer; his determinedly unorthodox daughter, Magdalena Kuisl; and her reluctant lover Simon Fronwieser, a would-be intellectual and the rebellious son of the town doctor. The novels’ point of view moves back and forth between these three main characters, giving Pötzsch plenty of opportunity to present their interesting and engaging personalities. Jakob Kuisl, the robust but melancholy and hard-drinking hangman, had been a soldier fighting in the long war, but returned home to Schongau to take up the family profession, which by long custom was passed down from father to son. The town hangman is considered cursed and unlucky, so he’s something of a pariah in the community, but his outsider status gives him the freedom to investigate crimes his own way, and to pursue his own interests – mainly healing, in Jakob’s case. Kuisl is well-versed in traditional folk remedies, as well as knowledgeable in the newer medical advances of the Late Renaissance: he is a literate man, and has a hoard of books both old and new. Jakob’s daughter Magdalena shares her father’s talent for healing, as well as his sharp and logical mind, but she’s also active, inquisitive, and persistent. Her wit, determination, learning, and dark good looks have won the heart of the ambitious Simon Fronwieser, but their relationship is fraught and virtually forbidden, for as a hangman’s daughter Magdalena is considered unclean, uncanny, and practically a witch – entirely unsuitable as a match for the son of a respectable burgher. Besides, Simon’s father, the town doctor, bitterly resents the fact that most of the town – his son included – believe the hangman to be a more effective healer than the doctor. Pötzsch has done a fine job bringing the characters and culture of old Schongau to life, and the setting is entirely convincing. It helps that it’s based on research into his own family’s background, as he himself is descended from those Kuisls who were the historical hangmen of Schongau for generations. His description of the hangman’s art is fascinating, if sometimes gruesome, though he has made his Jakob Kuisl a thoughtful and introspective man who performs his tasks from a sense of necessity and a feeling that another in his place would be less careful – and ultimately, less merciful. The hangman Kuisl, his meddlesome and mettlesome daughter, and her scholarly lover get caught up in some seriously dark and lurid affairs there in the back woods of Bavaria. The novels move fast, and are really more thrillers than mysteries, as “whodunit” is never all that hard to figure out. Pötzsch keeps the action flowing, with murder, madness, and mayhem, abduction, escape, and intrigue to spare as he switches back and forth between his three protagonists. The dark forests are haunted by renegade ex-soldiers, religious fanatics abound, ancient treasures excite mad avarice, and the immediate explanation for anything unexplained is witchcraft. Pötzsch has a talent for concocting creepy, Grand-Guignol villainy, and his heroes need quick thinking and derring-do to take the villains down. The results, in the first two novels, are very satisfying. The next two books in the series, “The Beggar King” and “The Poisoned Pilgrim,” are now available in English language editions as well. I’m looking forward to reading them. “The Hangman’s Daughter” and “The Dark Monk” are available from Amazon in trade paperback, Kindle ebook, and unabridged Audible download formats. 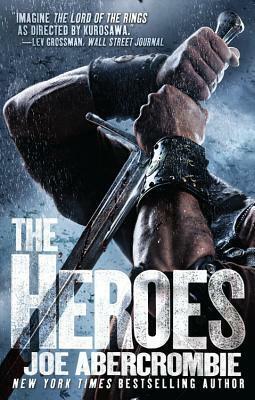 The Heroes, by Joe Abercrombie. Orbit, 2011; reviewed in the trade paperback edition. Here’s a good one: a big, sprawling account of an epic three-day battle between two quasi-late-medieval armies, detailing the messy and horrific business of killing people using edged weapons and arrows, and the human costs to the soldiers involved who do it. The novel is set in an original fantasy world, not, it seems, so the author can sprinkle in magic and monsters, so much as to set him free to conjure up his own history, and indulge his facility for evocative character names. These latter are quite memorable, including such monikers as Black Dow, Curnden Craw, Lord Marshal Kroy, Hardbread, The Bloody-Nine, Whirrun of Bligh, and Brodd Tenways, to name just a few. I admire a writer with a gift for names, and Abercrombie definitely has it. As the above list indicates, The Heroes features a large ensemble cast of protagonists, drawn from every faction on both sides of the conflict. The novel starts with a small clash between scouting parties on what will become the field of battle, irises out to introduce the two sides, the leading figures, and their backstories, then ramifies to bring in lesser characters all over the map as the great armies lurch into collision. This is one of those novels with about a dozen main characters whose stories connect and cross-connect, illuminated by about two dozen others, each of whom gets a brief moment in the sun. Since this is a kinda-sorta-historical tale of medieval(ish) soldiers, only two of the main characters are women, which is a shame because Abercrombie is as good with women as he is with men. The most memorable of these is the daughter of a general who gets accidentally caught up in the mayhem, but nonetheless finds a means to change the course of the battle, despite lacking the skills or inclination to participate in the butchery. And butchery there is, in spades. Abercrombie’s clash of armies is inspired by the American Civil War battle of Gettysburg, and he doesn’t bother to try to hide it – rather the opposite, as he includes playful references to his source. The forces involved are called the North and the Union (opposing sides in this case, rather than the same), and one of the Union’s leaders is named General Meed – a clear nod to General Meade of the Army of the Potomac. The way the scattered divisions of the two armies collide in a town at a radial crossroads, and the surge and counter-surge of battle over the subsequent three days, are all reminiscent of Gettysburg. But the details and the characters are all Abercrombie’s, and this is where the novel shines. His Union side recalls the organization and administration of the Federal army in the Civil War, and, indeed, just about every nineteenth-century army, which gives Abercrombie the opportunity to portray – and skewer – the classic types we know from historical and fictional accounts. Here are the familiar staff and soldier characters from the Napoleonic wars through the Spanish-American: the earnest young officer with his first command, the doomed and clueless conscripts, the venal and hustling veteran shaking down his fellows with loaded dice an stolen gear, the pompous general who thinks of nothing but advancing his career, and the political appointee who is more dangerous to his subordinates than to the enemy. But these archetypes are drawn with a deft touch, and their failings are depicted with a humor dark and wry. (Did I forget to mention that this book is not only engaging and exciting, but funny as well?) Abercrombie uses the archetypes as touchstones, but then fleshes them out into real people over the course of the battle. Unexpectedly, Abercrombie’s opposing side, the North, is a very different kettle of fish, far from a mirror-image of the Union. Where the Union resembles a European culture after the Enlightenment (albeit without the invention of gunpowder), the North is a feudal realm of warlords and bloody-handed kings. The warriors of the North fight for personal loyalties, and their virtues, such as they are, are those of Robert E. Howard’s barbarians. They don’t fight in disciplined formations, like the uniformed troops of the Union, and their greatest fighters are the Named Men, who earned their names in notable exploits of killing. In Abercrombie’s hands, the differences between these two very different cultures are less interesting than the similarities. Individual soldiers on both sides fight for the same reasons – for advancement, for loot, for loyalty, for glory, or just because they’re paid to – and they suffer the same wounds, to body and soul. The setting of The Heroes is what we who work in the Fantasy-Industrial Complex call a “low-magic world.” There are no dragons or other monsters, and while both sides have magicians among their allies, they’re not particularly effective or influential. The power in this world is in steel, point and edge, and the minds and muscles of those who wield it. The warriors clash, desperately, courageously, cowardly, or sometimes all three, and after a series of suspenseful reversals, the great battle grinds to an inevitable close. Not all the main characters survive, but the ones who do all learn something about themselves – though not everyone likes what they learn. I see now why Joe Abercrombie is a rising star in the historical fantasy market – this is the first novel of his that I’ve read, but it won’t be the last. Recommended highly and without hesitation. “The Heroes” is available from Amazon in trade paperback, Kindle download, Audio CD, and unabridged Audible download formats.